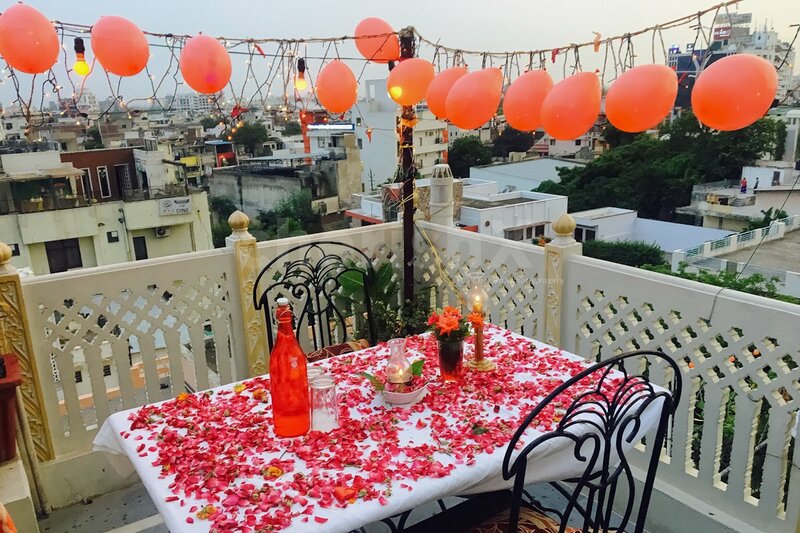 Enjoy a romantic candle-light dinner overlooking the glorious city of Jaipur on our exclusive rooftop sitting where you escape from your daily routine and treat yourself and your loved one to a delight for all the senses with our Rajasthani ambience and feel. So allow us to take you on a culinary journey with a 3-course sumptuous meal that caters to your every wish. 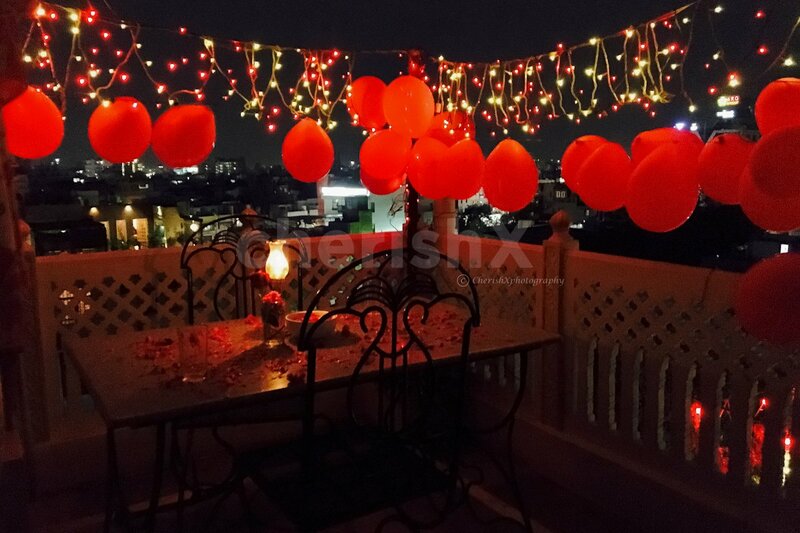 Rose petal, balloon and fairy light decorated table with beautiful glass crockery and vintage table lamp décor will take you in a world of dreams. Reach the destination of your reverie easily as it is situated very near to the Vidhayakpuri Police Station and no need to worry about parking as the restaurant have parking space as well. 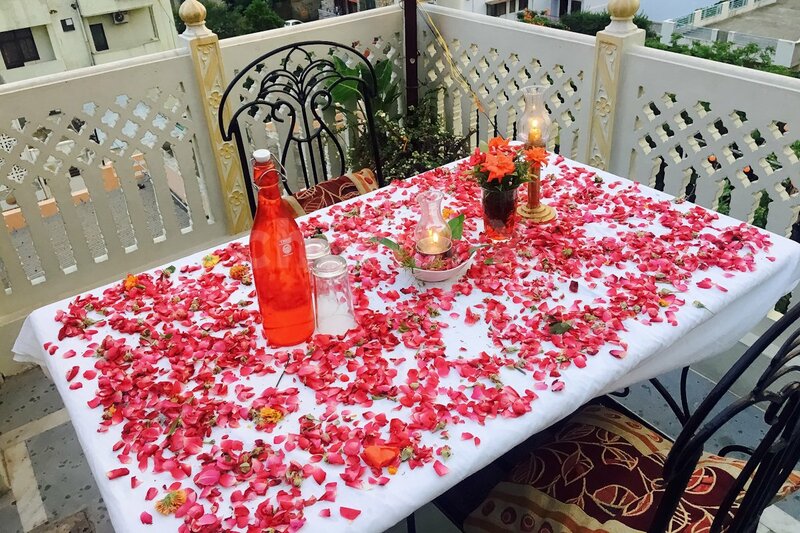 Experience the romance of a candlelight dinner with your special someone and rekindle your emotions in the most elegant way as the host will be waiting at the reception to welcome you to the most private rooftop dining experience with Mocktails. The chef and private butler will caress your taste buds with some exotic North-Indian and Chinese delicacies amidst the radiance of the candle flames and balloons surrounding you and the cool breeze and dim lights setting the mood right for getting cosy. The three course meal will have starters, main course and desserts. To spice up the things more, you can even opt for customisations like cake, an exquisite flower bouquet or a pick & drop with some extra cost. With us, you can easily eliminate the booking hassles and get amazing décor and superb service experience!